And so on, until six minutes have passed. The technician then walks to the next point, records the habitat information, and conducts a bird survey. They may have anywhere from four to 16 point counts in a given morning, depending on how many points we have permission to access. 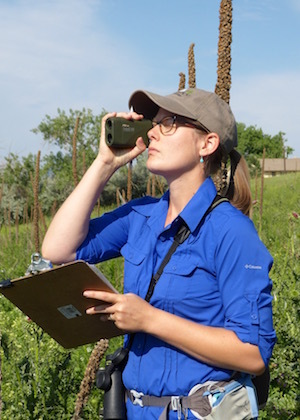 A field season spent conducting point counts has the potential to be transformative, from those who are just breaking in their field boots to the folks whose binoculars have seen many beloved life birds—and perhaps even to private landowners, the stewards of the Great Plains. Ultimately, yes, bird monitoring surveys are about birds, but it’s really the people who make it successful. With 97 percent of the land in the PLJV region privately owned, coordination with landowners is critical to the success of the program. Every morning we spend surveying birds on private, state, and federally managed lands, we are being given the opportunity to contribute to something much larger than ourselves. It is our goal to count birds—and lots of them—but we also work hard to spark relationships in hopes that we will continue to have many successful seasons of point counts in the future.